It’s down to the one last encounter of India’s long tour of Australia. There couldn’t have been a better finish to the tour as the ODI series is locked at one victory apiece. The final and the deciding ODI will be played at the Melbourne Cricket Ground on Friday. While Australia would hope to win the first series of the tour, India would love to go back with another trophy alongside the Border-Gavaskar Trophy. Keep reading to find out Australia vs India 3rd ODI Match Prediction. Australia dominated the first match and inflicted a comprehensive victory. But India made a great comeback to level the series. The Adelaide ODI was a classic example of how team India has played in the last few years. The Men in Blue prefer chasing in this format, all because of the two wonderful chasers – Virat Kohli and MS Dhoni. The hosts compiled 298 runs batting first. India’s chase was guided by a Kohli special hundred. The captain scored 104 and led the near-perfect run chase. But the No.3 batsman got out before finishing the job. However, Dhoni was still at the crease. He stayed until the end and with a knock of 55 from 54 balls, took his side past the line in the last over. 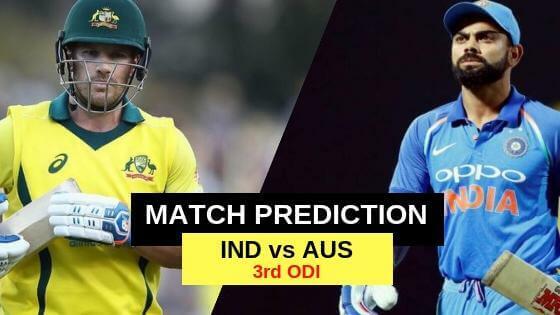 Australia vs India 3rd ODI Match Prediction: In the series finals, India has had a superb record in recent years. In the T20I series as well, they had won the last game. Virat Kohli and his men will leave no stone unturned in trying to clinch yet another series down under.